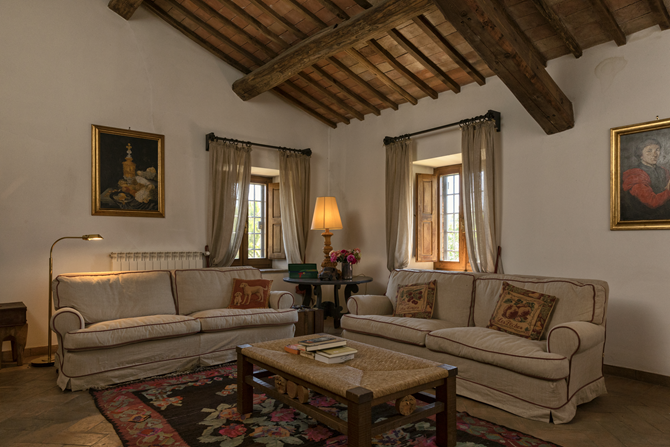 Pergola is a spacious apartment on the first floor with several rooms for up to five people and one infant or toddler. There is a kitchen-diner and a living room, both with a fireplace. 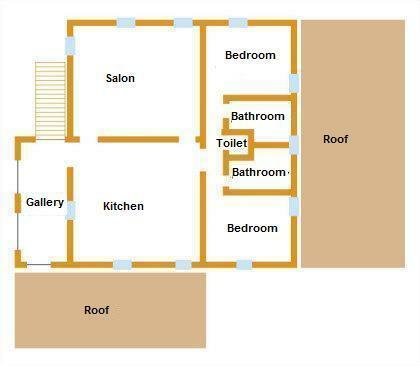 The two bedrooms, one for two and one for three people, each have their own bathroom with a bath, shower and toilet. There is also another veranda and a separate toilet. The kitchen is equipped with an oven, a stove, a fridge with freezer, a microwave and a dishwasher. A mixer, toaster, juicer and coffee machine are also present. 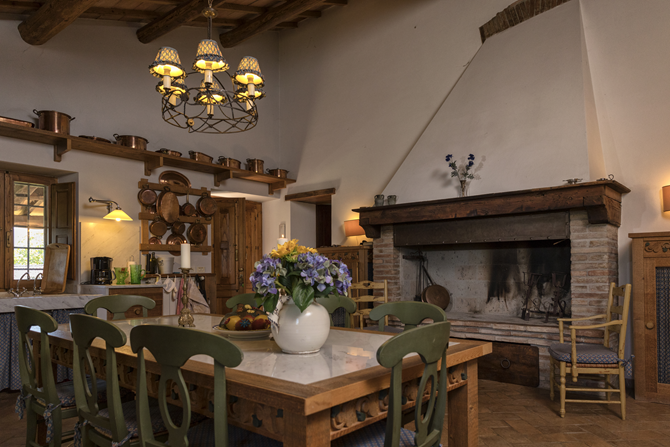 A large antique fireplace gives the spacious kitchen real character. The large dining table with a wooden bench seats a twelve. 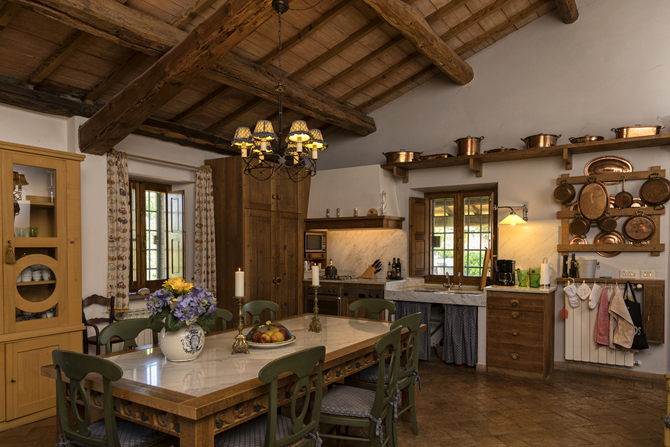 The kitchen has all possible luxuries, including TV, telephone and Internet access. 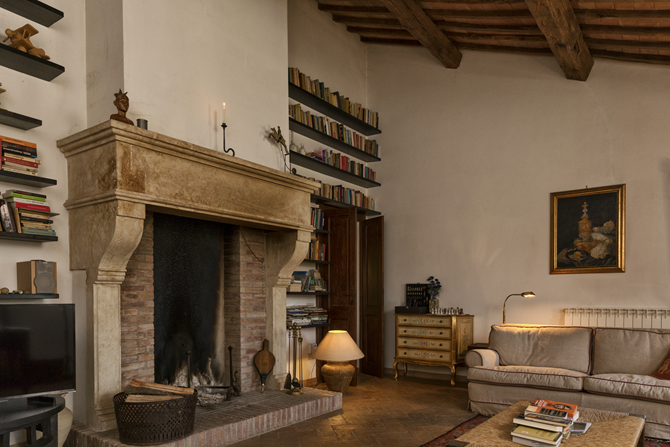 In the large, stylish living room, two sofas, an armchair and an antique writing desk create a cosy atmosphere. An extensive list of wines, grappas and olive oils on offer in the cantina may give you some ideas. 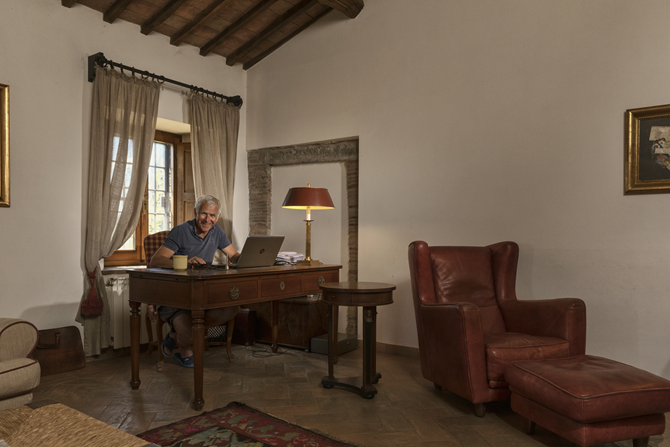 There is also satellite TV and video, a stereo, telephone and fax, as well as Internet Access. 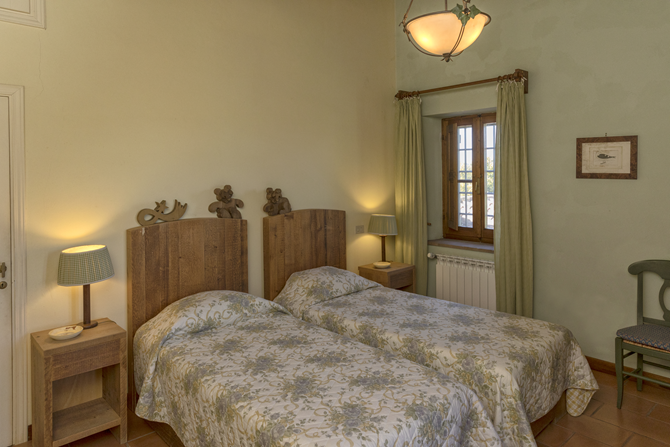 Pergola has two spacious bedrooms with wardrobes and cupboards. One room has a double bed. 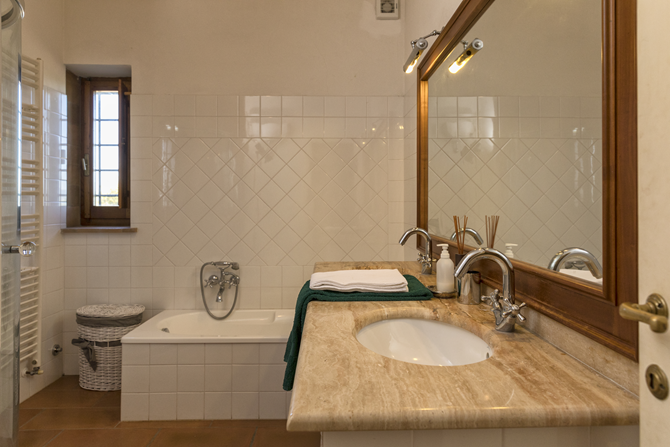 A door takes you through to the adjoining bathroom with two basins, a bath, a shower and a toilet. The other bedroom has two single beds and a third trundle bed. A hall gives access to the bathroom and a separate toilet. 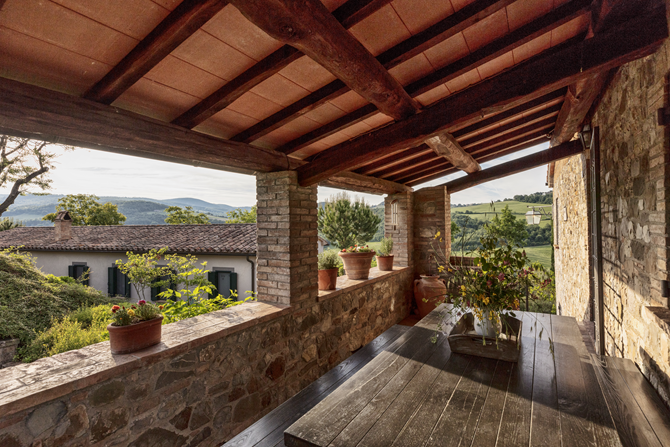 The veranda gives an unrestricted view of the surrounding landscape and the pozzo with the swimming pool. A wooden table and benches for eight make it a comfortable place to be. The veranda leads on to the kitchen-diner. 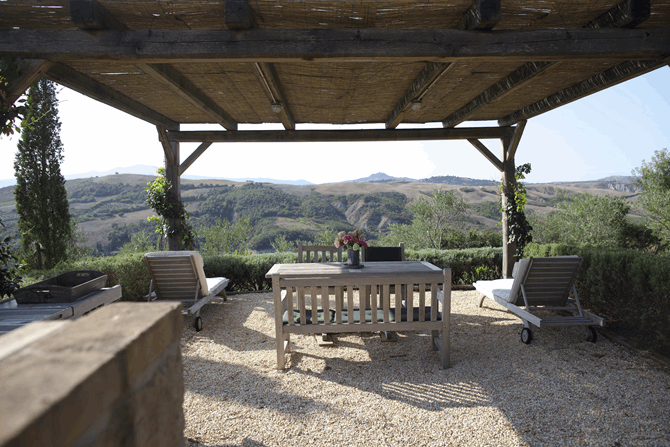 The guests of the upstairs apartment of the main house, called Pergola, can also enjoy a specially for them newly constructed terrace with pergola in the middle of the oliveyard. It has a view on the lake downstairs the hill and other panoramic views on for example the tower of Radicofani, where the mille miglia passed and also on Monte Amiate, where you can ski in the winter. It's just an amazing view. 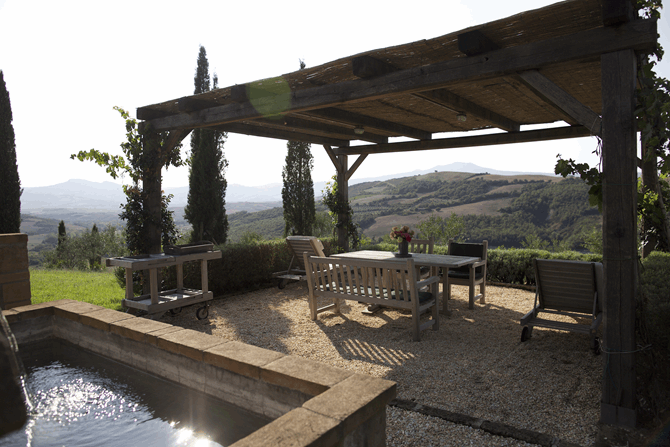 It has close to the babecue also a classical tuscan fontanella with pernament running water. 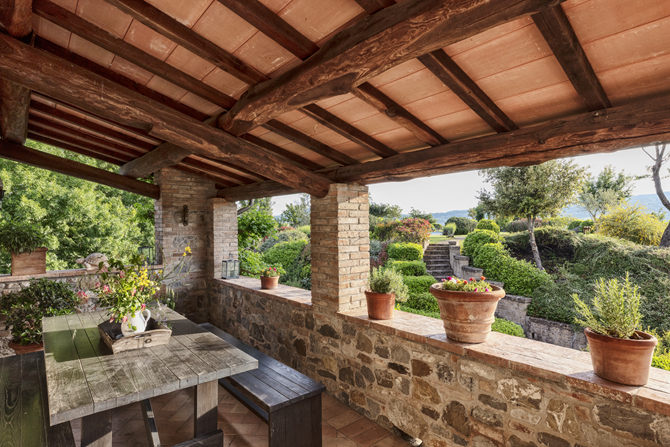 If the guests of Pergola don't rent this terrace, it is for common use for all guests.